The important factors to consider when selecting poi handles are preferred handle materials, intended grip style, and the poi moves you intend to do. There are four choices for handles: PomGrips, UltraKnobs, Double Fingerloops and Single Loop. Lanternsmith PomGrips are made from a grippy, high-temp rubber. 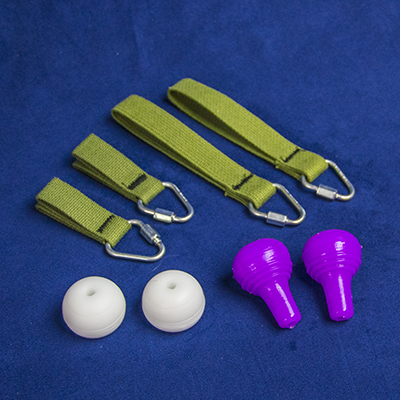 They are weighted and shaped for tosses, and have holes through the middle to connect to leashes or swivels. UltraKnobs made by UltraPoi, are rechargeable RGB LED silicone handles. This knob can be set to any of the colors of the rainbow, as well as strobe patterns that create intricate light trails while you spin. Double Fingerloop Handles loop around the index and middle fingers. These cotton loops provide a solid, constant connection between you and your poi leashes. Single Loop Handles have a single large cotton loop that partially inverts to tighten on two fingers more snuggly than double fingerloop handles can. *NOTE When measuring overall length, single loop handles are considered 2" shorter when we build leashes to account for the reduced length that happens when you invert them to put them on.